The Dragon GRS from Norica is a powerful, aesthetically pleasing air rifle that will do the job you need it to do. 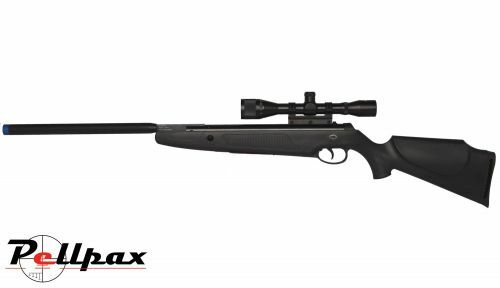 The rifle includes many features that are the beneficial to the user such as the automatic safety and the ambidextrous design. The Dragon has a Ventilated rubber recoil plate. This makes it more pleasant to shoot as it absorbs the recoil from the air rifle and stops injury to your shoulder. It has a pistol grip which provide a comfortable and secure hold when shooting. The barrel is forged from anodized aluminium. This makes it very durable against wear and helps keep it look top quality for a prolonged period of time. The Dragon GRS Evolution air rifle features a gas ram system. This has many advantages over springs for example they weigh less, longer life and they often shoot pellets quicker than equivalent spring guns.